Many businesses think that they can find customers anywhere, so the need for SEO (search engine optimization) seems absent. Unfortunately, as omnichannel marketing becomes more popular and relevant, you could be missing out on revenue-producing traffic that comes from SEO marketing. By targeting the right keywords, you bring more prospects and interested visitors to your web site, which leads to higher conversions and sales. The best SEO solutions for small- to medium-sized businesses begin with the right keyword research. The better commercial intent a keyword has, the better the traffic will convert. If you want more profit at the same level of investment, you should consider working with an SEO firm to achieve your business goals. Instead of missing out on this opportunity, SEO companies in Toronto can help you benefit from the qualified leads SEO can bring you. SEO increases traffic to your site by focusing on keywords, meta descriptions, and tags. It uses mathematical equations or algorithms to sort posts based on a specific set of criteria and incorporates the use of a sequence of SEO metrics like indexed content, Alexa rating, domain age, inbound links, social media following and more. Through this, it allows you to rank higher than your competitors. In 2018, it’s imperative that you company incorporate some of these SEO strategies into your online marketing campaign. “Featured snippets” in Google search are when a user asks a question and a block pops up at the top of the search results page. This block includes a summary of the answer, taken from a webpage; a link to that page; the page title; and the URL. This has become a major part of local SEO search strategy. Out of 112 million keywords tracked in the U.S., 14 million have featured snippets in the results. This number has continued to increase over the years. The growing popularity in smartphones has changed how people search for information online. It has also affected the way we search, as we can now use our voice to ask questions online. Currently, Google reports that one out of every five searches are voice queries. Because of this, the search engine giant has shifted its focus to intent instead of pure keywords. Intent is equally as important in SEO strategies as keywords—you need to understand what a user’s intent is behind their search to better understand how to help them. There are over 1.2 trillion searches made on Google each year, which is a lot of data to analyze. To manage this information, Google and Bing have turned to AI to interpret the results. Understanding how this technology works can also help you make your site rank higher for the right topics. It is important to get to the top of search engine results, and equally important to stay there. 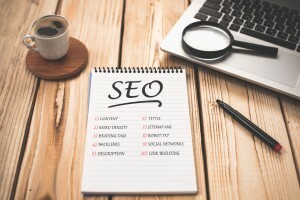 You need to keep on improving your SEO strategy to keep your business evolving. By ranking higher on Google, you will appear as the more reputable source for information when a user makes a search, and your ad or webpage will be viewed more for being on the first page. One of the main goals of starting a business is to make a steady revenue. The more people you have connected to your business, the higher that revenue will be, especially if you gain loyal customers and clients. Using SEO strategies, you will be able to grow your small- to medium-sized business dramatically. You will make a higher revenue without investing much more than you were before. As the facts stand, SEO can increase your web site visits by 300%. SEO can also help you to attract local customers and prospects. Using the right keywords and including locations in the search terms can help you to bring on the customers you need. This works best for franchises who operate in a specific location. For example, if you have a series of flower shops in Toronto, you can implement search terms like “flower shops in Toronto,” or “flower shops in the GTA,” to meet the queries of your prospects. With SEO, the content that generates leads will continue to do so without an ongoing cost. Once your strategy is set up, all you need to do is maintain it. There’s no need to constantly invest in a strategy unless you are due for an upgrade or want to try something different. This leads to a better return on investment. Chances are, you will gain much more leads that boost revenue, in comparison to what you invested in your SEO strategy. If using advertisements has been your primary means of gaining customers, SEO strategy will benefit you much more. A recent report stated that 95% of search users ignore the ads they see on search engines and click on organic results. So even if you want to spend money on each click for your ads, prospects will prefer to ignore these ads and go to organic results from your competitors. Ranking on search engines within the organic results makes you look more reputable and will attract more prospects to your web site. SEO strategies can help you stay ahead of your competition and maintain your position in the ranks. Your competitors are likely using SEO to gain more leads, so if you are still behind you could be missing out. SEO strategies have been implemented into marketing strategies for years, and the sooner you start the better results you can expect to get. According to research, the amount spent on SEO is expected to rise annually, which means more of your competitors will also be investing in it. SEO also helps you to increase the authority of your web site, which makes it easier for you to rank for more search terms. If you’re looking for professional SEO services in Toronto, Numero Uno Web Solutions is the team you need. We provide our clients with many marketing solutions such as SEO, content audit services, online reputation management, web designing and development, and more. We are a content marketing agency in Toronto that specializes in helping small- to medium-sized businesses improve their web sites. For years, our SEO company in Vaughan has helped clients across the Greater Toronto Area, Texas, Massachusetts, and Florida, boost their marketing strategies and grow their businesses. Call us at 1-855-SEO-XPRT to learn more about the services and expertise we provide.